Mafia Game could be as the main entertainment for small groups, and one of the major additions to large corporations - and those, and those we have fought so that there is a bit of experience. 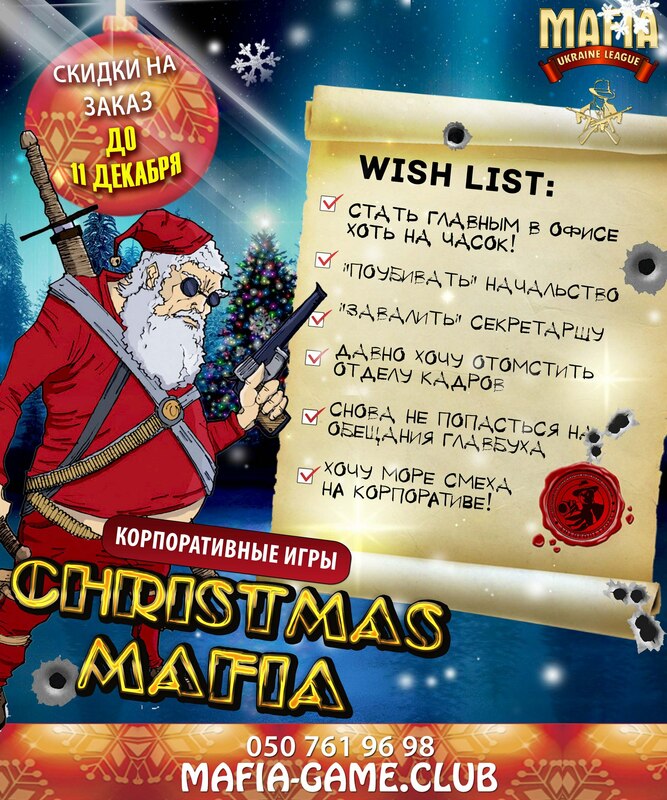 Mafia World Game, Inc - network of gaming clubs in Ukraine, Poland and Russia. We run the games on a regular basis since 2010: club games, costume parties, themed games, birthday parties, corporate events, boarded ships (pirated games on the ships), English mafia. We will be glad to organize a holiday in your town! Mafia as business training There are companies and corporations that collect their employees 1 time per week at the end of the working day for this fun. In the form of a game can be seen teamwork, effective argument, presented themselves level of leadership, creativity, and another 115 words of brief "Statement:" ... The game is objectively valid. This is an imitation of life, a workflow. The shortened version 1.5 hours. Companies from 10 people. The game "Mafia" perfectly fit into your holiday meal. Anyhappy birthday or corporate event you can blow up a portion of a good laugh - already tested in many Birthdays :)! In battle, you can join the company from 10 people. During the game you can eat and drink, and the most cunning, even manage to toast to say! Help in finding good places if required. The "Mafia" can be played both at home and in the restaurant and on the boat, or simply in the nature! As it turned out the current generation of far-striding and children aged 11-12 years, with eyes like a cat from Shrek, managed to convince the parents of his innocence and winning Mafia - personally in front of your humble host was the case :). During the game, the child begins to speak, to communicate, to learn to shape their thoughts more clearly, to understand how to build it correctly. The child has the opportunity to engage in discussion with their own parents without fear of being punished, because It presents a game element. Age - 11 years. Variant games without sexual and violent roles (adult version). We know how to make your party more fun! experienced presenter (more than 1000 games). Initially, the game tells all the rules + repeats the function of role-playing cards in the first battle of the night. The process of shooting and voting becomes clear after 7 minutes - checked for players aged 10 to 67 years. There is something to do "dead" civilians :) Included in the order. For a good night, a separate room, as will loudly and laughing, and from the discussions! We will help you to choose the location for fun in the right town and the right country :) Just help with photos, video, animators, caricaturist, casino gaming, and other optional entertainment.